This cute train cake is assembled using store bought cake, and if you like, store bought frosting. Although, we’ve included a recipe for our favourite vanilla buttercream because it’s simply delicious, and of course, you could bake your own Madeira loaves if you wanted to. 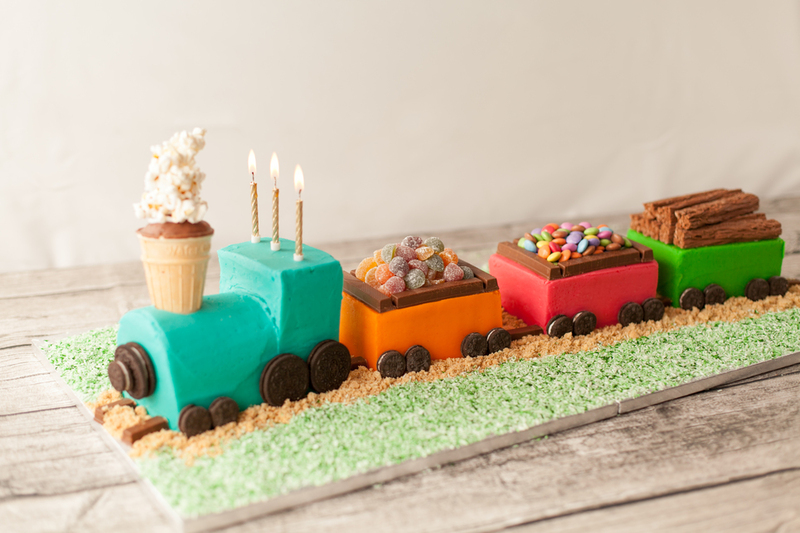 Apart from the time-saving from using bought Madeira sponges, it’s also easy to cater for more hungry kids by simply adding on more carriages and then topping them off with different sweets! Click here to download the cake template. Sift in icing sugar and add milk or cream, vanilla and salt. 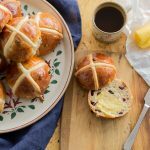 Start beating together with mixer on lowest speed, once icing sugar has been mixed in, increase speed and beat until frosting is smooth and creamy. 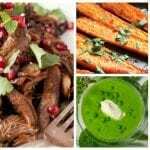 Make sure to scrape down the sides of the bowl so that everything is well incorporated. 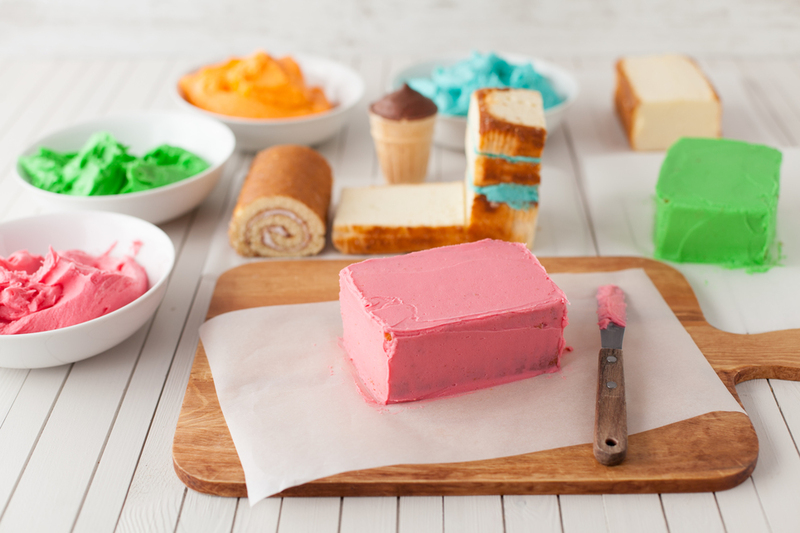 Divide buttercream into four, then colour each with desired colour. Set aside. 1) For the 3 carriages, trim both ends off each loaf, then trim the tops of each loaf so that you are left with neat rectangles that are approximately 12cm long. For the train’s engine, trim the ends off the remaining Madeira sponge as well as the top so that it’s approximately 15cm long. Then, cut out a portion of the sponge so that you’re left with a an “L” shape, and the smaller rectangle that has been cut out will be approximately 10cm long. Take this smaller piece of sponge and then cut it in half so that each is 5cm long. The Swiss roll will be sitting on the sponge shaped like an “L”, so cut it to match the length of the section that was removed, approximately 10cm. 2) Use a small amount of buttercream to attach the smaller 5cm rectangles to the “L” shaped sponge, then use a small amount of buttercream to secure the Swiss roll to the same sponge to create the train’s engine. 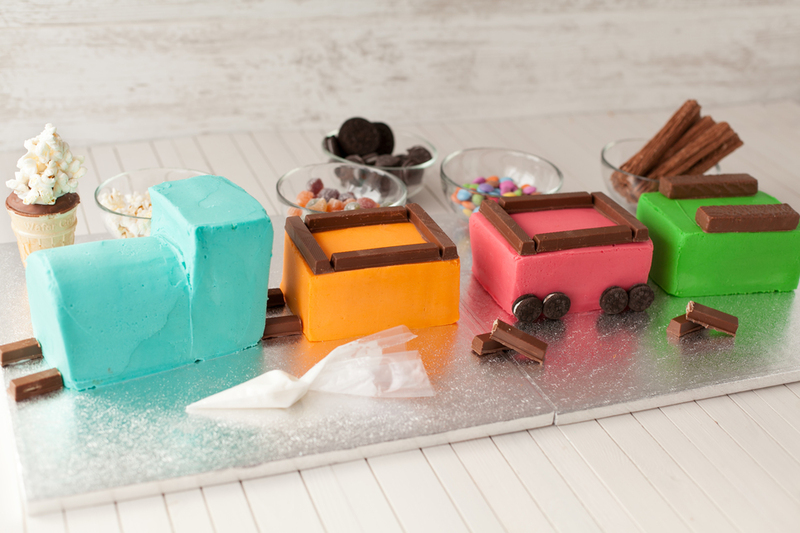 Crumb coat the carriages and engine with just enough buttercream to trap any stray crumbs. Place each one in the fridge or freezer while you crumb coat the others so that the buttercream firms up. 3) Once the crumb coats are firm, frost each carriage and the tank with its final coating of buttercream. Place each in the fridge or freezer for 10-15 minutes to allow the buttercream to firm up, this makes it easier to position them as well as decorate. Position the tank in the middle of one of the cake drums near the edge, then position one of the carriages behind it, with a space of about 2 fingers in between. Position the other 2 carriages on the second cake drum, also with about 2 fingers of space between them. Follow the instructions on the packaging of the instant royal icing powder to mix up a small amount of royal icing. 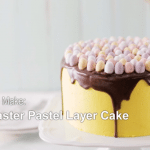 You’ll only need about 5 tbsp mixed icing in total. The easiest way to apply the royal icing is to use a piping bag, or even a freezer bag with just the tip of the corner trimmed off. Start decorating the carriages and engine. Attach the “wheels” with a bit of royal icing, using the smaller biscuits for the carriages and the front of the engine. Then attach the chocolate wafer fingers to the carriages to create a border which will keep the sweets in place. Also create train tracks by trimming chocolate wafer fingers to fit into the spaces between each cake and attaching them to the board with a small bit of royal icing. For the train’s engine, stick a miniature chocolate biscuit to a larger one, then attach this to the nose of the tank with some royal icing. To create the chimney, if using a wafer cup, use the royal icing to glue the popcorn onto the wafer cup, building up so that it looks like smoke. If using an ice-cream cone, trim the end of the cone to remove the point, then fill with popcorn and use the royal icing to glue popcorn together, building it up so that is looks like smoke. 4) Finally, top off each carriage with its loot of sweets or chocolates. To attach the chimney to the tank, use a round pastry cutter the same size as the base of the cone to cut out a small round from the tank. Carefully place the chimney in the hole, you can secure the chimney in place with royal icing if you like. Place digestive biscuits in a freezer bag and use a rolling pin or similar to crush them into fine crumbs. Scatter the crumbs in between the tracks as well as around the train. Place the coconut into a freezer bag, then add a few drops of green food colouring. Seal the bag and give it a good shake, also rubbing the bag between your hands to help the colouring spread and tint the coconut. Add a few more drops if needed. Use tinted coconut to cover the rest of the cake drums. You can add any other finishing touches you like. Cut out the birthday boy or girl’s age from a piece of ready to roll icing and stick it to the sides of the engine or carriages. You can also decorate with sprinkles or gold and silver balls, coloured sugars etc. Finish off with candles or sparklers. 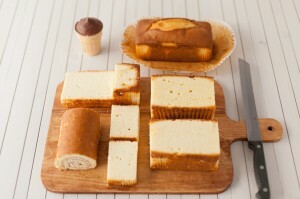 As the boards are not connected to each other, it’s easiest to have the cake set up on its table before decorating with the crumb “sand” and coconut “grass”.